​Spending time outdoors is a common activity on spring breaks or summer vacations, but remember to protect against the sun’s rays. Everyone is at risk for sunburn. Children especially need to be protected from the sun’s burning rays, since most sun damage occurs in childhood. Like other burns, sunburn will leave the skin red, warm, and painful. In severe cases, it may cause blistering, fever, chills, headache, and a general feeling of illness. 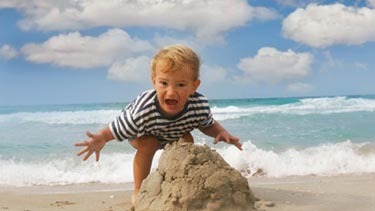 The American Academy of Pediatrics offers tips to keep children safe in the sun. When adequate clothing and shade are not available, parents can apply a minimal amount of sunscreen with at least 15 SPF It is okay to apply a small amount of sunscreen on infants under 6 months if there is no way to avoid the sun SPF (sun protection factor) to small areas, such as the infant’s face and the back of the hands. Remember it takes 30 minutes to be effective. Select clothes made of tightly woven fabrics. Cotton clothing is both cool and protective. Try to find a wide-brimmed hat that can shade the cheeks, chin, ears and back of the neck. Sunglasses with ultraviolet (UV) protection are also a good idea for protecting your child’s eyes. Apply sunscreen with an SPF 15 or greater to areas of your child’s skin that aren’t covered by clothing. Before applying, test the sunscreen on your child’s back for an allergic reaction. Apply carefully around the eyes, avoiding eyelids. If a rash develops, talk with your pediatrician. The sun’s damaging UV rays can bounce back from sand, water, snow or concrete; so be particularly careful of these areas.